The quarry of Pai Mateus in Paraíba, Brazil is a striking place. 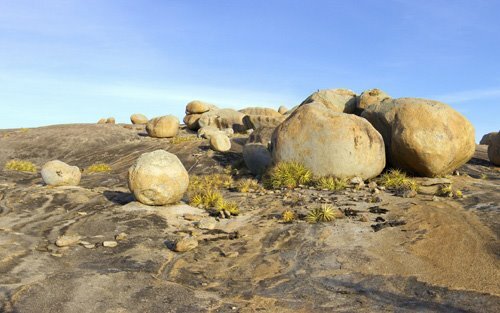 Giant boulders baking in the sun. The dry sertão rolling off into the distance. A woman drove off after a heated soccer match between local teams with her infant daughter straddling the gas tank of her motorcycle, bare thin hair to the steady wind. The way to the top follows a huge sloping dome of rock. The boulders just start showing up closer to the top. Round, ovular, lumpy, smooth, crumbling. Stray vegetation pokes through cracks and hides in crevices. A horse in the darkness wound it's way slowly down the sidewalk to the lobby of the hotel but thinking differently headed back. At the top is the helmet shaped rock where the Pai Mateus or Father Matthew spent part of the 18th century. Isolated, quiet. An arching large indentation in a massive rock, a natural protection from sun and weather. A farmer used a machete to chopped a pile of charred cactus to feed to his livestock. Thinking about it makes me thirsty.